Just a quick note to let our readers know that we are doing just fine after a rough couple of days in Queens, NY. 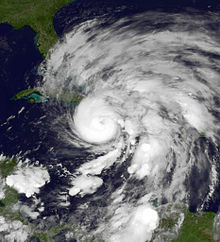 We never lost power, but we have been hunkered down in our apartment with lots of ramen and wine. The storm has passed and we went out to check out the damage. Lots of trees down, power lines are down or significantly lowered, and it looks like we may not have any subway access until next week. Thanks to our friends for the texts and calls! We will keep you posted if anything changes. Last weekend Matt’s mom flew into town for a couple days so we could celebrate her very recent birthday, and also to toast to the baby(ies) on their way. We knew that by Monday morning, at the close of our weekend, we should have the first sonogram of our pregnancy, six weeks into things. Our merry trio went out for drinks, took in a Broadway performance of Evita (Ricky Martin was the best part, and not just because he’s not hard on the eyes), and went out for a dressed-up dinner at Del Posto afterward. Matt and his mom are true foodies, so it was a lot of fun to watch them savor the delectable dinner. On Sunday we caught the great, smart thriller Argo, and spent some wonderfully lazy time at our apartment, just hanging out together. But by Sunday night, it was in the air: We were all a little restless, on pins and needles to get the sonogram results from the clinic. Matt kept refreshing his e-mail inbox as we headed to bed after midnight, knowing Monday morning business hours had begun in Mumbai. In the morning, Matt’s mom showered and packed her bags, getting ready to fly back home. I packed my bags, too, preparing to fly out to Houston for the week for work. We both looked at Matt, who looked at his phone, and then back at us with a shake of his head. A Town Car took me to Newark Airport, and I kept looking at my phone, making sure the ringer was on, waiting to hear from Matt. Forty-five minutes later, as a United machine spit out my plane tickets at the airport, my phone rang. “Are you ready for this?” Matt asked. Blown away doesn’t even cover it. It was the most wonderful, surreal experience. Matt and I laughed, excitedly parsing all the details we’d been sent. We knew the next big sonogram would happen at 11 weeks, wherein we’d have a battery of genetic tests, thoroughly examining the health of each fetus and looking for any concerning irregularities. The clinic also let us know that if the health of the babies, or the mother, were in danger due to the triplet pregnancy, that they would need to reduce the pregnancy to twins. Twins come early as it is, we learned, and triplets come even earlier, especially when your surrogate is barely five feet tall and can’t accommodate three full-term babies in her small body. Triplets increase the odds of early birth, low birth weight, with potential fatal risks for the babies. Having to reduce is wrenching, of course, but we want everyone healthy and safe when delivery time comes, and that very likely means twin births at most. Our doctors will be monitoring things very carefully in the coming four-plus weeks, and their medical determination will be the final word on that front. With all of that in mind, that’s why the title of our post reads “TRIPLETS*!” with an asterisk. We’ve been prepared for the high likelihood that we’ll have a twin birth in late spring of 2013. It’s also good to keep in mind that we’re still early on in the pregnancy, too; one or zero babies are still possible at this point. However, we’re hoping for the best, and for textbook, low-risk births next year. Matt and I have been poring over the sonogram images of our babies (“Baby A” is above, on the right), and the official reports. Our estimated delivery date falls around June 12-16, 2013. Of course, knowing we have a multiple pregnancy, the babies are virtually guaranteed to come earlier than that. Three well-defined gestational sacs are seen in the uterus, our report reads. They show a good chorio-decidual reaction around them. A fetal pole is noted in each sac. 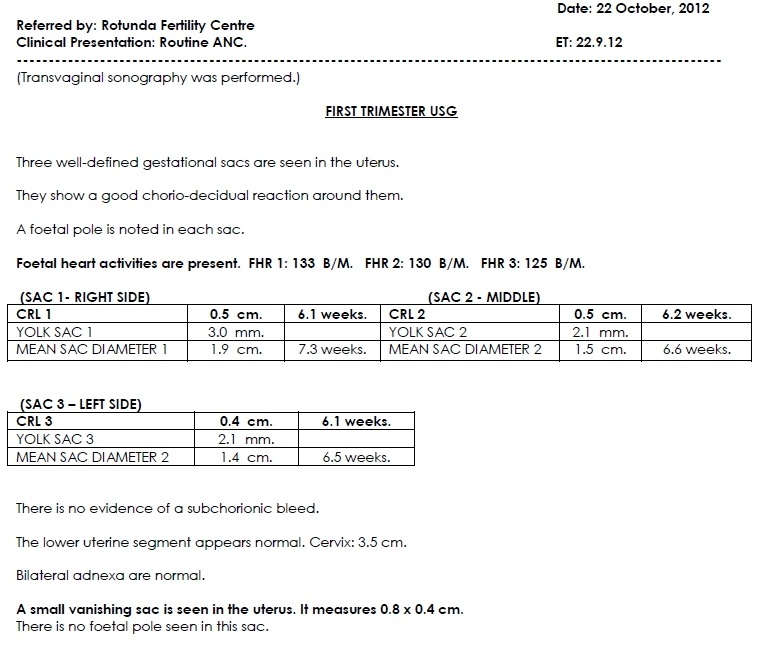 Fetal heart activities are present. 125-133 beats per minute. There is no evidence of subchorionic bleed. The lower uterine segment appears normal. Bilateral adnexa are normal. 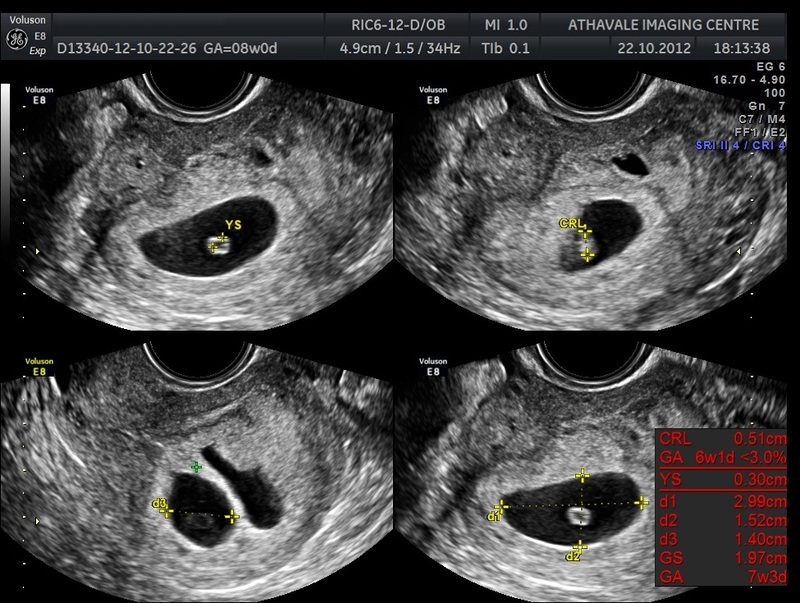 There’s a little surprise at the bottom of the report: A small vanishing sac is seen in the uterus. There is no fetal pole in the sac. What does that mean? It means that all four implanted embryos actually latched in the womb. The fourth embryo stopped multiplying, and did not develop into a fetus, but it’s still latched to the womb at the moment. The remaining three embryos have become fetuses. It’s crazy because in our first round of IVF we had three implanted embryos, and none latched. Zero percent. This time we were four for four, a perfect 100% for latching. So, what now? We wait and watch. Right now we have three fetuses, each about the size of a snow pea. Tiny eyelids are forming and hand plates are appearing. We have three sets of heartbeats. At eleven weeks (around Thanksgiving), we’ll know if we need to reduce from a triple pregnancy to a double. Most importantly, God willing, we’ll be dads before summertime. 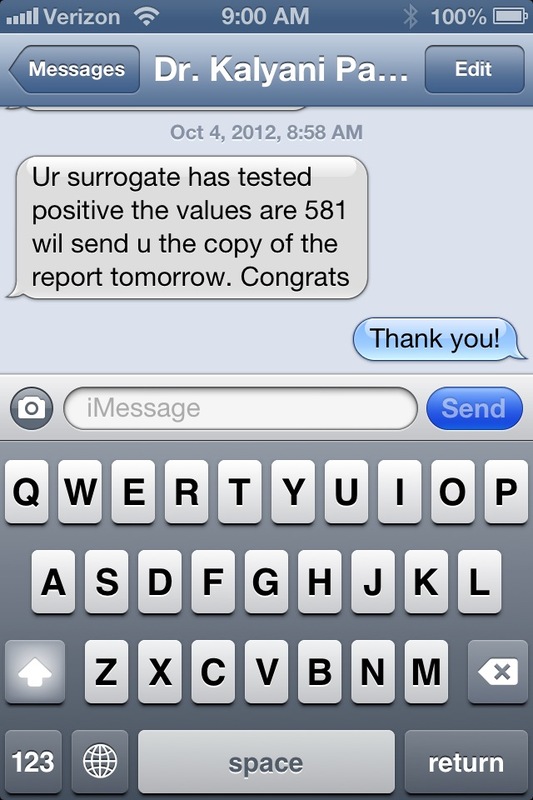 Two days after our initial beta HCG test score of 581, another HCG test was run. What they are looking for is roughly a 2x increase every 48 hours. I’m happy to report that our second value was 1360, even higher than expected! The 3rd blood test, taken 4 days later, reported a staggering 9340! Now we can’t wait for the first ultrasound in 10 days because there is definitely a possibility of multiple pregnancies! Thanks to everyone for your messages, your comments, and your phone calls over the past week. I’m definitely freaking out a little bit at the thought of what my life could be like by next summer (in a good way), and your support has meant the world to us. On Thursday I got off the subway in Soho, on my way to work, and happened to pull my phone out of my bag. I saw that I had three missed calls from Matt and right away my brain went to one thing: bab(ies). Could this be the big news, if we were pregnant or not? We didn’t think we’d know until the weekend. But with three missed calls from Matt, all right in a row, I figured something was up, one way or another. I hoped against hope for good news and called him back. I almost walked into a tree. He read the text message to me. It was such a surreal moment, walking down Prince Street on my way to work, and hearing that, via text message from 7,000 miles away in India, our surrogate had tested positive for pregnancy. Matt and I traded ridiculous little text messages back and forth during the day. Needless to say, we were thrilled, especially with one round of surrogacy behind us that hadn’t worked out. I think having gone through that experience made us even more grateful to have a positive pregnancy test confirmed. 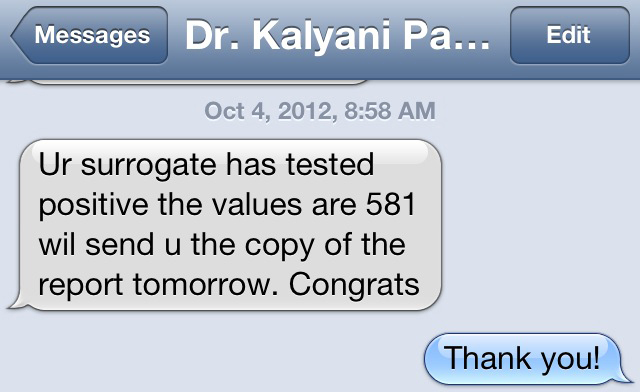 The clinic e-mailed us the beta hCG test results shortly after we got the text message. I did a little reading online to find out more about hCG, wanting to understand more about what the results meant. 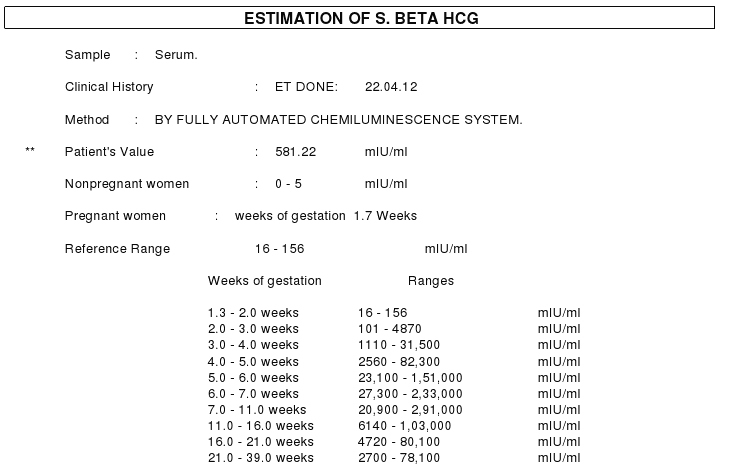 Our beta hCG results (shown on the right–click to enlarge) show that our surrogate’s levels at 1.7 weeks were at 581.22 mlU/ml. As you can see, our number is more than three times higher than the high range listed in the chart. So, what could that mean? As I learned online: possible multiple pregnancies. Yes, that was the sound of our jaws hitting the ground. We started making our phone calls, telling our friends and family the good news (with the asterisks, of course, that we were early into the first trimester, but still excited, and sharing because we promised to share, etc.). Matt’s mom was thrilled. She called back several times during the day to chat more about the news. When I told my grandparents there was so much happy yelling that I had to hold the phone away from my ear for a moment. It’s been so fun to call and share the news with people. We’re definitely feeling the love from the friends and family in our lives. So, what’s next? We have our first ultrasound the week of October 22. That’s when we’ll be able to tell if we have a single pregnancy, or multiple pregnancies, and we’ll get a little more news about the health and development of the fetus(es). Needless to say, that date is circled in bright red in our minds. We’ll try not to chew our nails (too much) before then. 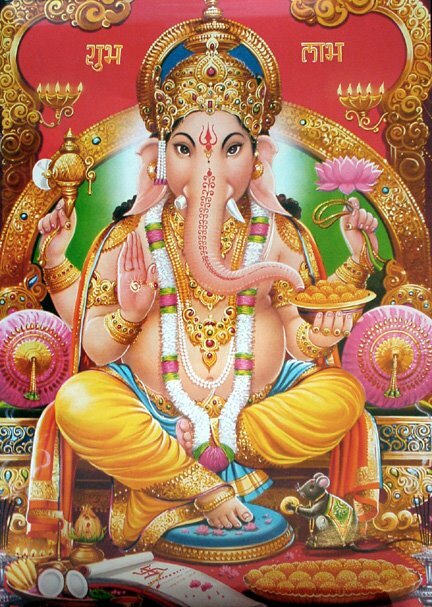 In the East, Ganesha is widely worshipped as the god of wisdom, prosperity and good fortune, and is traditionally invoked at the beginning of any new venture. Ganesh Chaturthi is an annual celebration that marks the rebirth of Ganesh, and this year, it fell on September 19th, the day that our embryos were created using my sperm and a donor egg in Mumbai. Coincidence? I have a very good feeling about this….